A Spirit from God, not from anything else. Thus he raised up the dead and made birds from clay... God purified him in body and exalted him in spirit, and made of him a symbol of engendering. to meet truth naked and unencumbered. Great Sufi Master and Mystic Ibn 'Arabi, who was given direct experience of meeting Christ in the inner realm, in many veridical vision and dreams refers to Jesus as 'mathalan bi-takwin', or "symbol of engendering". In the metaphysical perspective of Ibn 'Arabi's school, one of the most important principles of which the "Qur'anic" Jesus stands forth as a "symbol", sign, and concrete embodiment, is the following: mercy and compassion are the fruits of the realization of the true Self - or self of the Real, the Nafs al-Haqq, as Ibn 'Arabi calls it. Compassion, in turn, should be understood not only morally but also, and a priori, metaphysically, in terms of the bestowal of life: God gives life to the cosmos out of compassion for His own hidden qualities that long to be known; and man participates in this process both positively - through being compassionate towards his own self, as well as towards others - and inversely, by enlivening his own soul and that of others through the knowledge of God. The Qur'anic narratives concerning Jesus, together with the esoteric interpretations thereof from the Akbari perspective, illuminate these intertwined realities of selfhood and compassion in a particularly fruitful manner. Jesus is described in the Qur'an "as a sign for mankind and a mercy from Us". Ibn 'Arabi draws out, in a most instructive way, how these two aspects of Jesus can be spiritually understood: what Jesus is a sign of, and how this relates to mercy or compassion. God has spoken to mankind in several different ways. He has spoken to people through revelation or from behind a veil, and His speech has sometimes carried orders and prohibitions and sometimes not. Likewise, God's messages have been brought down to people either in the form of a Word, like the Qur'an and the Bible (Old and New Testament), or in the form of an "event" like the birth of Jesus, portrayed as a sign (âya) from God in the Qur'an. This "symbol of engendering" of Jesus can be considered in four ways. First, the creation of Jesus himself - by means of a breath, a word, a spirit, cast into Mary - is a miraculous sign of God's creativity in general, of the way in which the spirit enlivens matter. Secondly, the creation of Jesus is a recapitulation of the specific miracle of the creation of Adam. O Mary, Truly God has chosen you and purified you, and preferred you above all women of creation. O Mary, be obedient to your Lord, prostrate to Him and bow with those who bow (III:42-3). And We made the son of Mary and his mother a sign (XXIII:50). 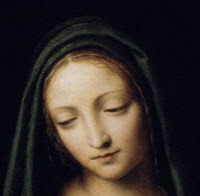 Thus Jesus can be seen as a symbol of the cosmos itself, the "fruit" of the activity that is rooted in total, virgin receptivity to the Word from above, Mary's role here mirroring that of the Muhammadan Reality. Truly I come unto you with a sign from your Lord. Truly, I create for you out of clay the shape of a bird, and I breathe into it, and it becomes a bird, by God's permission. I heal him who was born blind and the leper, and I give life to the dead, by God's permission (III:49). "Truly I create for you, through spiritual discipline and purification and realized wisdom, from the clay of souls still deficient but nonetheless receptive, the shape of a bird, one that flies to the realm of holiness through the intensity of its longing.Then I breathe into it the breath of divine knowledge and true life, through the influence of my presence and my teaching. And it becomes a bird that is, a living soul, flying with the wings of longing and aspiration towards the Real.I heal the blind, the one who is veiled from the light of the Real, one whose eye of insight had always been closed, and had never seen the sun of the face of the Real, nor its light... and the leper, the one whose soul is disfigured by the disease of vices and corrupt beliefs, blemished by the love of this world and besmirched by the stain of concupiscence. And I give life to the death of ignorance with the life of knowledge." In the spirit of this kind of commentary, one might venture to add that the words of the Qur'an, by God's permission, which qualify the miraculous acts of Jesus, can be understood, esoterically, as meaning that these acts were performed by Jesus in perfect conformity with his knowledge of who the agent really is; who the true Self is, within him, that is performing these acts. In other words, Jesus was not veiled from the Divine reality by his own performance of these acts: he knew that God was acting through him. The fact that God is the sole agent emerges in the Akbari perspective as an inescapable subjective corollary of the objective oneness of being, or, to use Ibn 'Arabi's own words, of the reality "that there is nothing in Being but He. "Ibn 'Arabi comments in many places on the ontological implications of the verse in the Qur'an, which states "You did not throw when you threw, but God threw"(VIII:17). 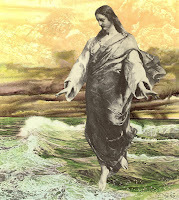 Such ambivalent negations and affirmations give rise to bewilderment: You are not you when you are you but God is you. But they reveal the truth that it is God alone who is the agent of all acts, the agent who acts through all the faculties of man.